The past week in the airline space was all about earnings, with several airline companies like American Airlines Group Inc. AAL, Southwest Airlines Co. LUV, Spirit Airlines, Inc. SAVE, Alaska Air Group, Inc. ALK and SkyWest, Inc. SKYW reporting second-quarter 2018 financial numbers. Even though all the above-mentioned carriers reported better-than-expected earnings per share, high fuel costs limited bottom-line growth. In fact, quarterly earnings declined year over year at American Airlines, Spirit Airlines and Alaska Air Group due to high fuel costs. Also, American Airlines trimmed its earnings per share projection for 2018 on increased fuel costs. In the second quarter, fuel prices increased expenses by more than $700 million. Fuel costs are expected rise 30.4% or $2.3 billion in 2018 at this Fort Worth, TX-based carrier. 1. American Airlines’ second-quarter 2018 earnings (excluding 41 cents from non-recurring items) of $1.63 per share surpassed the Zacks Consensus Estimate by 4 cents. Quarterly earnings decreased on a year-over-year basis mainly due to high fuel costs. Revenues came in at $11,643 million, which fell short of the Zacks Consensus Estimate of $11,652 million. The top line, however, improved on a year-over-year basis. Solid demand for air travel led to the year-over-year improvement in revenues (read more: American Airlines Beats on Q2 Earnings, Cuts '18 View). 2. Southwest Airlines reported second-quarter earnings per share (excluding a penny from non-recurring items) of $1.26, beating the Zacks Consensus Estimate of $1.25. The bottom line also increased on a year-over-year basis. Operating revenues of $5,742 million lagged the Zacks Consensus Estimate of $5,771 million. However, the top line improved year over year. Passenger revenues accounting for bulk (93.3%) of the top line, slipped marginally due to an approximate $100-million impact from the accident in April (read more: Southwest Airlines Q2 Earnings Top, Q3 RASM View Bleak). Southwest Airlines carries a Zacks Rank #3 (Hold). You can see the complete list of today’s Zacks #1 Rank (Strong Buy) stocks here. 3. Alaska Air Group’s earnings per share (excluding 10 cents from non-recurring items) of $1.66 per share surpassed the Zacks Consensus Estimate of $1.63. Nevertheless, the reported figure declined on a year-over-year basis mainly due to high fuel costs. Revenues amounted to $2,156 million, which missed the Zacks Consensus Estimate of $2,174.2 million (read more: Alaska Air Group Q2 Earnings Top Estimates, Fall Y/Y). 4. Spirit Airlines’ second-quarter earnings per share (excluding 95 cents from non-recurring items) came in at $1.11, ahead of the Zacks Consensus Estimate of $1.09. The bottom line however, dipped 2.6% year over year on high costs. The carrier recorded revenues of $851.8 million, in line with the Zacks Consensus Estimate. Meanwhile, the top line improved around 21% year over year owing to 18.9% expansion in flight volume (read more: Spirit Q2 Earnings Beat, Decline Y/Y on High Costs). 5. SkyWest’s earnings per share of $1.43 exceeded the Zacks Consensus Estimate by 20 cents. Also, the bottom line expanded 50.5% on a year-over-year basis. A lower effective tax rate boosted the bottom line. Quarterly revenues came in at $805.5 million, marginally beating the Zacks Consensus Estimate of $804.8 million. The top line benefited from the company’s improved fleet mix (read more: SkyWest Q2 Earnings Surpass Estimates, Increase Y/Y). 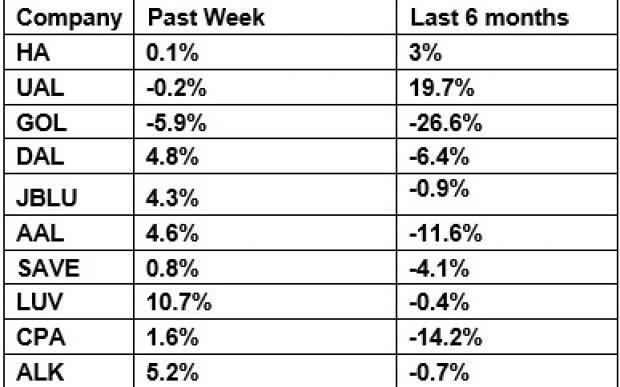 The table above shows that most airline stocks traded in the green over the last week leading to a 2.6% increase in the NYSE ARCA Airline Index. Over the course of six months, the sector tracker has decreased 5.2% due to multiple headwinds like high fuel costs. Investors will look forward to July traffic reports from the likes of Delta Air Lines, Inc. DAL in the coming days. 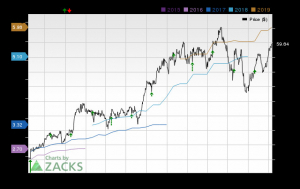 GOL Linhas Aéreas Inteligentes S.A.’s GOL second-quarter earnings report on Aug 2 is also likely to grab attention.